Sick of dealing with your fellow humanoids? Perhaps your boss is being a major misery guts or your cat’s bad language is dragging you down? Forget feeling the sand between your toes, get your grey matter straight into the deep blue and experience the best snorkelling on the Sunshine Coast. Snorkelling and exploring the marine life of the deep is not just breathtaking, but arguably the best stress therapy going around. And to top it off? You can’t hear one single annoying voice. Just bubbles, splashes, and the greatest sound of all: silence. Fancy a swim with the gentle giants of the sea? Dive and snorkel company Sunreef takes you up close and personal with whales just 15 minutes off Mooloolaba, and those who are lucky enough to experience and encounter them claim it’s “life changing”. Easily some of the best snorkelling on the Sunshine Coast, Sunreef provides all the required wetsuits and snorkel gear and say the winter months are best, when the big fellas are migrating. Once a whale is sighted, the boat is turned off 100m away, and swimmers can jump into the water while holding onto a floatation line attached to the boat. Then it’s all up to the whale. C’mon Willy! Actor Sean Connery knew where the snorkel action was at when he frequented Mudjimba Island (also known as Old Woman Island) several times with his wife in the 1960s. Home to an abundance of marine life including dolphins, turtles, stingrays, crayfish, wobbegongs, eels, and starfish, the best snorkelling is on the western side of the island where there’s a massive ledge of vibrant coral, and where large schools of fish reside. Can you spot Nemo? Oh, and maybe we should take this opportunity to mention the “sharks”. Eeep! Famous for its sand as white as your mother’s crisp sheets, Lake McKenzie is like a giant, luxury resort swimming pool plonked in the middle of wild and rugged forest, only far more naturally beautiful (no hair and Band Aids in sight!). The silica sand acts as a filter giving the water its purity, and while the lake can’t support too much life, you will still find a few sneaky schools of fish. If you’re desperate to get face down into those endless shades of pristine blues and greens, with the sun kissing your back, then be sure to get your glide on here. Just an hour from Brisbane, the Tangalooma Wrecks offer some of the best snorkelling in South-East Queensland. There are 15 wrecks which were deliberately sunk a few years back, creating a man-made reef; a pretty decent idea considering the thriving ocean life these wrecks have adopted. Expect turtles, wobbegongs, dugongs, and of course, fish galore. Chasing pretty coral? Flinders Reef is five kilometres northwest of the island and features around 100 species of coral and 200 fish species. Oh la la! Needing your cute turtle fix or maybe your kids are into the teenage mutant type? Hightail it straight to Coolum where there’s a shallow reef just off the cliff’s shore which is home to the gentle giants and many other marine life. The only slight difficulty here, is the reef is quite tricky to get to being at the base of the point’s cliffs and the currents can get a little strong, so we’re reserving this one for the more advanced snorkellers. Drifting through the calm waters of Amity Point will make for some fun, chilled snorkel time, but for serious sea-life explorers, you might want to make a bee-line to Point Lookout where all the marine action is. Want to take things to the next level and get cuddly with some manta rays? Manta Lodge & Scuba Centre runs boats out to Manta Bommie—ranked in Australia’s top 10 dive sites—and is a cleaning station for the migratory rays. There’s even octopus, lionfish, and leopard and babboo sharks. Not to mention the guitar sharks (twang!). A popular fishing spot, Raper Shoal is about 500 metres off Currimundi Beach, and offers a large rocky formation surrounded by plenty of sand. The rock is covered in some great coral with plenty of creatures to explore around the edges of the drop-off. So while you’re out in your tinny getting the catch of the day, don’t forget your snorkel gear, too. Oh, and with plenty of dolphins out that way you might even get a wave from Flipper! Want to get out there?! 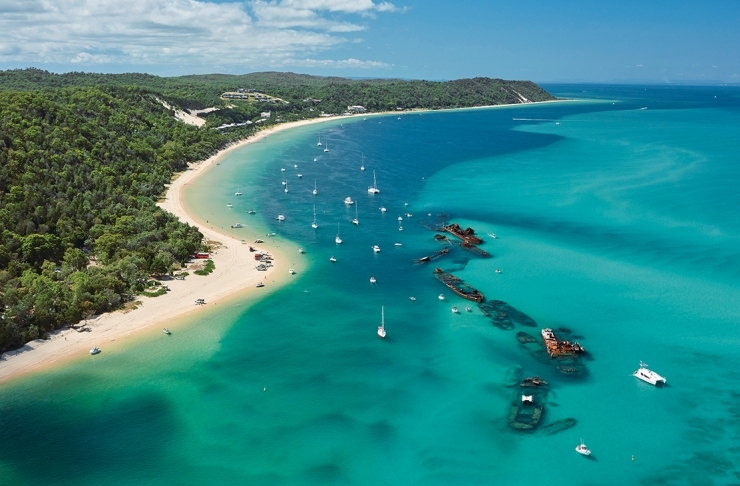 We've got the Ultimate Weekend Guide To Moreton Island here. What about a another weekend away? We've rounded up The Best Way To Spend A Weekend In Brunswick Heads here.